Temple on hill: Yoga Narasimha temple, Devarayana Durga, Karnataka. 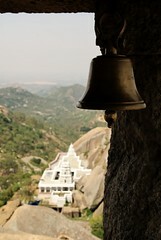 We had been to Devarayana Durga on a short half-day trip last Friday. The route was simple enough, taking Tumkur road and turning right at Dobaspet and going on a smooth empty road through the villages till we get the deviation to the fort which is marked by the Karnataka Tourism yellow boards; while coming back we took the other route at the bottom on the hill that went towards Tumkur. Since we had started early enough we were at the fort and the temple before the crowds came in. 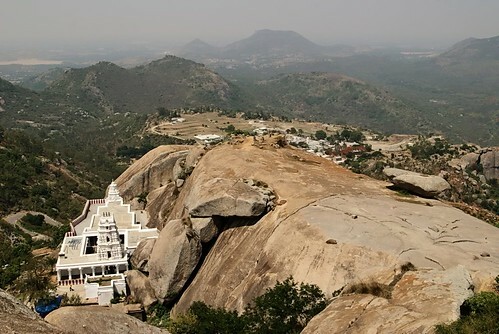 A series of well laid out steps takes you from the parking place to the temple after which a trail takes you further up to a small mantap atop the hill; the view from the temple itself is good but great from the top. The walls of the fort are minimal, lining some sections of the hill, with a couple of entrances. It was hot as the sun rose higher but one could relax under the shade of the mantap and enjoy the cool breeze for some time. We started back before it got too hot but thankfully there are a few places on the way to refresh yourself with coconut water and sugarcane juice. I am sure this place is even more pleasant in the winter. Therez a small hike somewhere near this place.. had plans to do it once but got dropped. What're you upto these days?